Easter Island is one of the world’s most remote places inhabited by people: 2500 miles from the nearest continent (South America) and 1200 miles from the nearest island (Pitcairn). At the same time it is one of the most enchanting archaeological sites: the mysterious enormous heads dotting the island have amazed people since the discovery by Dutch sailors Easter 1722. The Dutch discoverers found a primitive society with about 3,000 people living in squalid reed huts or caves, engaged in almost perpetual warfare and resorting to cannibalism in a desperate attempt to supplement the meagre food supplies available on the island. How could people make and transport the huge sculptures they found everywhere on the island from the quarry at the mountainside to the coast without machines, even without trees? The island was completely treeless at the time of discovery. Easter Island was given the name Rapa Nui (Great Rapa) by Tahitian sailors, in the 1860’s, as it reminded them of Rapa – a small island in French Polynesia (now commonly referred to as Rapa Iti). The story of the Easterislanders is tragic, but at the same time a good lesson for all of us. They had a highly developed civilisation for about 600 years, but neglected the environmental effect of their lifestyle and ended in catastrophe. They could not escape the island anymore, because every single tree had been cut. Modern research has revealed a lot about their life during their golden age – and about the causes of the catastrophe. The original Polynesians came from south-east Asia. They made long voyages in double canoes, joined together by a broad central platform to transport and shelter people, plants, animals and food. When the first people found Easter Island, they discovered a world with few resources. The island was volcanic in origin, but its three volcanoes had been extinct for many centuries before the Polynesian settlers arrived. Because of its remoteness the island had only a few species of plants and animals. There were thirty indigenous plants, no mammals, but many seabirds. The people who arrived in the fifth century*) probably numbered no more than twenty or thirty at most. The settlers on Easter Island brought only chickens and rats with them and because the climate was too severe for many plants grown elsewhere in Polynesia, they were restricted to a diet based mainly on sweet potatoes and chickens. The only advantage of this monotonous, though nutritionally adequate, diet was that cultivation of the sweet potato was not very demanding and left plenty of time for other activities. People had time for cultural development. The result was the creation of the most advanced of all the Polynesian societies and one of the most complex in the world. 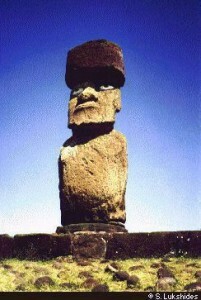 The Easter Islanders engaged in elaborate rituals and monument construction. The crucial centres of ceremonial activity were the ahu. Over 300 of these platforms were constructed on the island, mainly near the coast. A number of these ahu have sophisticated astronomical alignments, towards one of the solstices or the equinox. Rock paintings and scripts on wooden panels have also been found. At each site between one and fifteen of the huge stone statues survive today as an unique memorial to the vanished Easter Island society. These statues took up immense amounts of peasant labour. The most challenging problem was to transport the statues, each some twenty feet in length and weighing several tens of tons, across the island and then erect them on top of the ahu. Lacking any draught animals they had to rely on human power to drag the statues across the island using tree trunks as rollers. The only way this could have been done was by large numbers of people guiding and sliding them along a form of flexible tracking made up of tree trunks spread on the ground between the quarry and the ahu. Enormous quantities of timber were required. The population of the island grew steadily from the original small group to about 7,000 at its peak in 1550. By the sixteenth century hundreds of ahu had been constructed and with them over 600 of the huge stone statues. Recent scientific work, involving the analysis of pollen types, has shown that at the time of the initial settlement Easter Island had a dense vegetation cover including extensive woods. As the population slowly increased, trees have been cut down to provide space for agriculture, fuel for heating and cooking, construction material for household goods, pole-and-thatch houses and canoes for fishing. The most demanding requirement was the need to move the large number of enormously heavy statues to ceremonial sites around the island.. As a result by 1600 the island was almost completely deforested and statue erection was brought to a halt leaving many statues stranded at the quarry. The deforestation of the island meant not only the end of the elaborate social and ceremonial life; it also had other drastic effects on every day life for the population generally. Archaeological research shows that from 1500 the shortage of trees was forcing many people to abandon building houses from timber and live in caves. They resorted to stone shelters dug into the hillsides or flimsy reed huts cut from the vegetation that grew round the edges of the crater lakes. Canoes could no longer be built and only reed boats incapable of long voyages could be made. Fishing was also more difficult because nets had previously been made from the paper mulberry tree (which could also be made into cloth) and that was no longer available. No new trees could grow, because the rats, imported for food, ate the fruits and seeds. In archaeological site nuts and seeds were found, all visibly opened by rats. Removal of the tree cover also badly affected the soil of the island. Increased exposure caused soil erosion and the leaching out of essential nutrients. As a result crop yields declined. The only source of food on the island unaffected by these problems was the chickens. The society went into decline and regressed to ever more primitive conditions. Without trees, and therefore without canoes, the islanders were trapped in their remote home, unable to escape the consequences of their self-inflicted, environmental collapse. There were increasing conflicts over diminishing resources resulting in a state of almost permanent warfare. Slavery became common and as the amount of protein available fell the population turned to cannibalism. The magnificent stone statues, too massive to destroy, were pulled down. The first Europeans found only a few still standing and all had been toppled by the 1830s. When the Europeans asked how the statues had been moved from the quarry, the primitive islanders could no longer remember what their ancestors had achieved and could only say that the huge figures had ‘walked’ across the island. The Europeans, seeing a treeless landscape, were equally mystified. They imagined the most fantastic explanations. Against great odds the islanders had painstakingly constructed, over several centuries, one of the most advanced societies of its type in the world. For a thousand years**) they sustained a way of life not only to survive but to flourish. It was in many ways a triumph of human ingenuity and an apparent victory over a difficult environment. But in the end the increasing numbers and cultural ambitions of the islanders proved too great for the limited resources available to them. When the environment was ruined by the pressure, the society very quickly collapsed with it, leading to a state of near barbarism. An example of a collapsed population- as it happens with animals it can happen with humans. It did on Easter island. When a population grows (having no natural ennemies) it can reach a value that is not sustainable. Sudden near-extinction is the result. The population of Easter island followed the same line: at its height they were many thousands, in the 19th centure no more than a few hundreds. The fate of Easter Island can be a lesson for the modern world too. Like Easter Island the Earth has only limited resources to support human society and all its demands. Like the islanders, the human population of the earth has no practical means of escape. How has the environment of the world shaped human history and how have people shaped and altered the world in which they live? Have other societies fallen into the same trap as the islanders? For the last few millennia humans have succeeded in obtaining more food and extracting more resources for increasing numbers of people and increasingly complex and technologically advanced societies. But are we now any more successful than the islanders in finding a way of life that does not fatally deplete the resources that are available to us or are we too busy irreversibly damaging our life support system? An article in Science Express tells us that modern C-dating techniques make clear that the first colonisation of Rapa Nui must have been much later, about 1200 in stead of 400 A.D. The old estimate was made over forty years ago, when the techniques were not yet very good. If this is true, it means that the collapse of the ecosystems of Easter island happened in only 400 years! The lesson for the world is still stronger! The islanders told that the statues ‘walked’ but people did not believe them. Researchers found th at the probable movement was indeed a sort of ‘walking’. Now you can see it on youtube ‘Moai walking’. 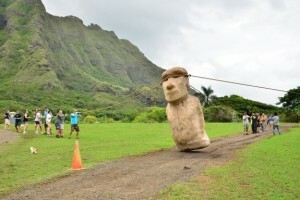 With 3 teams and and a strong rope, they make the statue walk… If it was done this way we do not know for sure. **) If this recent information is right the collapse happened in less than half of that time! a. Europeans found an completely treeless island. Why did the forest not return when the population dwindled after the collapse? b. Some people even thought the giant sculptures must heve been brought there by the gods, or by extraterrestrians. What arguments did they have? Why could they not believe people did it? 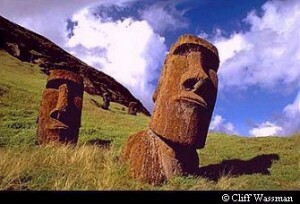 c. The first settlers on Easter Island came from Polynesia. How can that be proven? d. Compare the graphics in the story with the curve of the human population since prehistoric time. (Propably to be found in your geography or biology book). e. Not only the human population but also the energy consumption has been growing exponentially. Compare your daily energy consumption with that of your grandparents when they were young (ask them if possible!). Which possibilities do you have to use less energy? f. Make a list of ‘ecological mistakes’ the islanders made, and compare this with ecological mistakes we are making in our modern world. Why can we call the story of Easter Island a useful lesson for the world? g. What has to be changed in our society (or lifestyle) to prevent a collapse? h. How can we convince people around us that it is necessary to change some things to make our world more sustainable? – why this is important for us all to know this story. – why the planet could go a similar way if we do not change our habits now. 3. After reading this story (plus perhaps some of the websites) you can make a study about the question whether this case is unique in world history. Have other civilisations collapsed as a result of environmental problems? (Yes, with Stone Age Malta, the Maya culture and possibly more cultures the same happened – in a different way of course). Malta too was a densely forested island on which a culture developed with impressive buildings we can still visit today. The oldest buildings of the world! This culture also collapsed mysteriously – but quite certainly from deforestation. Even now the island is practically treeless. Easter Island (Rapa Nui): a site with more about the island, and further links. THE book for everybody interested in Easter Island. It gives the history of the island, the story of the discovery of the real secrets behind the sculptures and the mysterious collapse of the culture of the Easter Islanders through ecological catastrophe: “What did the man think who cut the last of the enormous palm trees only growing here?”. We will never know, but we can learn to not make the same mistake again. This biography combines an interesting view of the life of a Victorian lady that escaped her prescribed life with a story about life and research on Easter island in the first decades of the twentieth century by the same lady. Katherine Routledge lived on the island for several years and still had a chance to talk with people who remembered the life on the island before Europeans became influential. Jo Anne Van Tilburg is herself an archeologist who worked long years on Easter Island. In this book Jared Diamond tells about the collapse of Easter island, but also about several other cases of historical and modern societies who seemingly deliberately destroy the ecosystem they depend upon. He also tells about societies who managed to stop the destruction of their ecosystem and saved their environment. What made the difference? The message is: nowadays we know about the importance of the ecosystems, we have to make a choice to avoid the fate of Easter islanders.